Fishing seems to have slowed over the past few days and I must admit I have found things a little tough going. 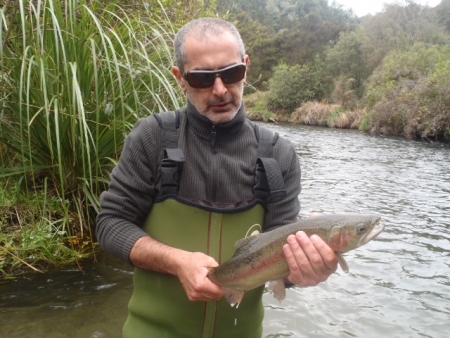 The Tongariro would have to be the best of the bunch with some really nice silver fish still available in here for those who hit the water early and move about a wee bit escaping the busy pools. 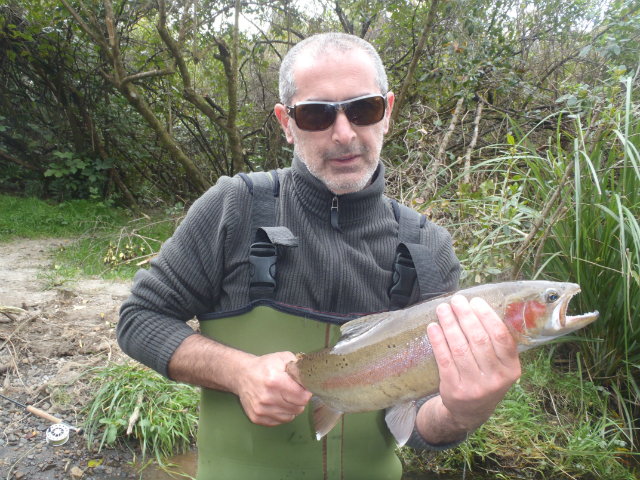 The TT has fish for those who like to walk but the lower reaches that I fished during the week were not showing much promise in the low clear conditions. I think the Hine may finally have seen the last of its best runs of fresh trout as the last few outings here I have seen nearly all recovering or spawning fish with very few silver trout. Maybe with a good dumping of rain and the dam spillingÂ there might be a few stragglers move up.Â Â There seems to be plenty of fish scattered right the way through but many are sitting on spawning beds doing their thing and should’nt really be bothered. This river has been low and clear one day and pretty much in flood and coloured up the next depending if they areÂ spilling the dams up high. Knowing what the waterÂ is doing in here can be a real guess at times as there is no accurate way of gaining information on here other than going down and looking with your eyes. 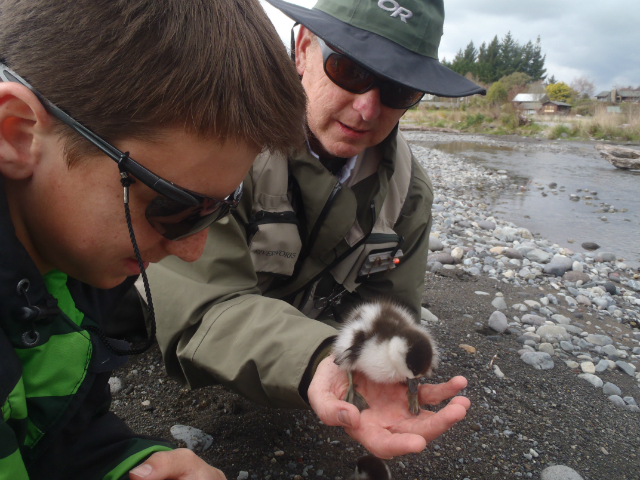 On Thursday I was out with Vern and his 14 year old son Shaun. 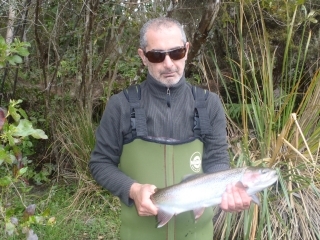 Vern is a very good fisherman who has been fishing Taupo for over 30 years but wanted his son to have a good day on the river learning a few new skills and hooking into some trout. Unfortunately my good luck had come to an end with these guys and after 12 hours of walking up 3 different rivers we still only managed two trout for the day, slightly better than a skunking!. I was gutted with this result and could’nt believe that the rivers had become so hard all of a sudden for no reason?? Luckily the next day Vern and Shaun managed two good fish from the Trolls hole on the Tongariro and returned home to Auckland with some fish to smoke. I suppose this is the beauty about fly fishing you just never can be sure when things will be hard or when things will seem easy. I’m sure Vern wont want to hear this but I eneded up guiding a full day on Friday also and enjoyed spending time with Dom from Melbourne who had not really fished very much in the last 20 years. The Hine was quite coloured and running high from the dam up high being let go and the fish were pretty much jumping on the hook snagging themselves??? I cant work out why one day can be so hard and the next really very easy?? All the fish we caught on Friday were either recovering, spent or spawning trout which must have been in the river the day prior so I suppose the extra water must turn them on or something. Anyways Dom had an amazing day with hooking over 20 fish and landing about half of them which were all caught on small natural patterns such as PT variants or the killer Quasimodo nymph. 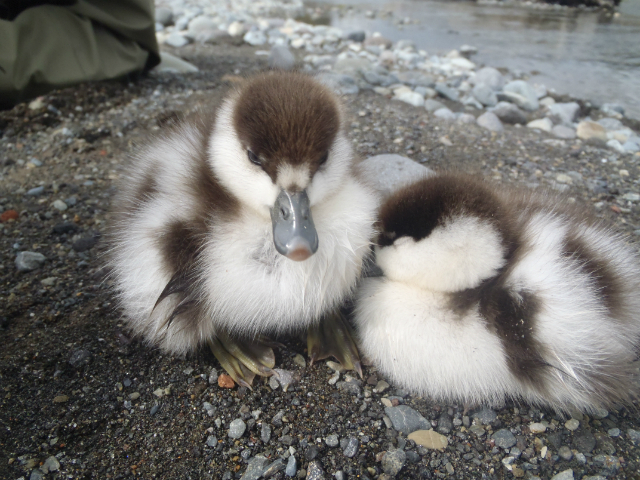 As you can see from the pictures about the most exciting part of Thursday was the two day old Parry ducklings Shaun and Vern found in front of Tongariro lodge which decided to follow us around the braids. These birds were left alone in the open and were obviously getting cold and hungry as they had been left by Mum so we rang the bird lady (Carol Harwood ) to come and take them from us. Carol looks after many kinds of animals that are left by their mothers and brings them to good health before releasing back to the wild to hopefully live normal life’s. I think Vern may have been glad his daughter was not fishing with us as they may have ended back in Auckland!! We are all hanging out for the opening of the new backcountry season on Monday!!! Vern and Derek I will not be able to get a report done till after Thursday as I will be having four very big days on various fisheries OK!!! I promise I will report back with some interestingÂ stories which will hopefully occupy some office time on Friday OK! Be safe if you are venturing somewhere off the beaten track.